Virat Kohli’s side kept their dominance intact in the limited-overs format as India beat South Africa by 28 runs in the first T20I in Johannesburg. After India posted a mammoth 204-run target batting first, South Africa’s top order collapse ensured that the side ultimately fell short while chasing. 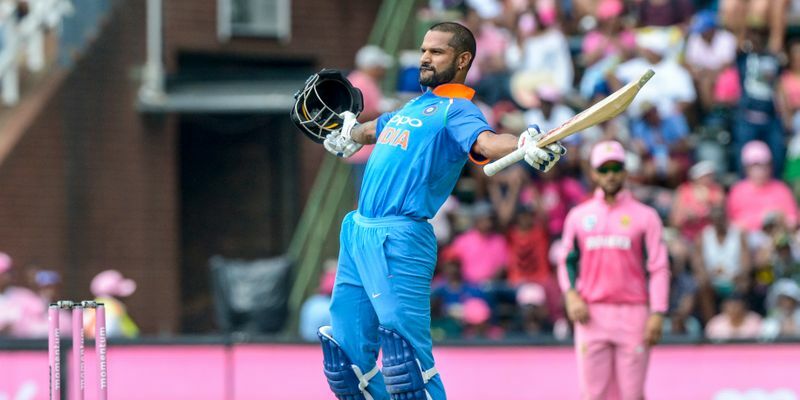 Brief Scores : India 203/5 (Shikhar Dhawan 72, Manish Pandey 29*; Junior Dala 2/47, Andile Phehlukwayo 1/16) beat South Africa 175/9 (Reeza Hendricks 70, Farhaan Behardien 39; Bhuvneshwar Kumar 5/24, Jaydev Unadkat 1/33) by 28 runs. South Africa opted to field first after their armory was further slashed just before of the match with the sudden withdrawal of AB de Villiers with a knee injury. India, on the other hand, came into the game without chinaman bowler Kuldeep Yadav, who saw Jaydev Unadkat replacing him to make a five-pronged pace attack. Though Virat Kohli revealed after the toss that India wanted to field first as well, their first innings didn’t show any such inhibitions. Rohit Sharma went on about his natural order of play as he hit two sixes and two boundaries in the seven balls he play before returning to the dugout. To everyone’s surprise, making his T20I return after a year, Suresh Raina replaced Virat Kohli as the No. 3 batsman in the squad and followed the same aggressive strategy. However, the southpaw’s stint couldn’t last any long either as he departed after two overs, hitting two boundaries and a maximum. Amidst the quick dismissals, though, India’s run kept soaring high as they were 49/2 in just four overs. The strong start made it all the more easy for the incoming Kohli to get going, but it was Dhawan who took up the cudgels this time as he hit Chris Morris and Dala for four boundaries and a six. Behardien did the unthinkable next by dropping Kohli at long-on, and the skipper punished him with a boundary and a six before bringing up a 50-run partnership with Dhawan. However, the audience wouldn’t see him stay for long as Kohli was caught plumb by Tabraiz Shamsi in the very next over, as India ended halfway line in a strong position of 110/3. With Rohit, Kohli and Raina back to the pavillion, Dhawan took it upon himself to take charge and extend his brilliant form on the tour. Seeing Manish Pandey struggling to play big shots, Dhawan took on Shamsi for a four and six to bring up his half-century and continued his pyrotechnics against Phehlukwayo and Dala as well. However, his adventurous finally came to an end in the 15th over when he was caught behind by Heinrich Klaasen on a tame shot as India were reduced 155/4 in 15 overs. With Dhoni coming in next, the crowd had every reason to rejoice, but the former skipper looked even safer than Pandey in going about his trade and the spiking run rate started to fall. India could manage only 26 runs in the next three overs, which also included a dropped catch by Shamsi before Dhoni was bowled by Morris as India were reduced to 183/5. The estimated target, which was well over 200 after the first 15 overs, had dropped drastically and if not for Hardik Pandya’s late boundaries, India might not have crossed 200. The visitors ended their innings at a competitive 203/5. India started with Bhuvneshwar Kumar in the attack and the seamer successfully managed to heap pressure right from the very first over, where he gave away only 6 runs. Chasing over 200 has always been a burden in T20s and the hosts needed to hit everything that came their way. After a nascent Unadkat went for three boundaries in the second over, Bumrah struck with his fifth ball of the day as he scalped Muts’wicket as SA were reduced to 29/1. Unadkat came back strongly in the next over, leaking just five runs that heaped more pressure on the hosts. Consequently, skipper JP Duminy had to return to the pavillion the very next over, attempting to go big as Raina did brilliantly to judge the ball and send the SA captain packing. David Miller walked in next in the crisis situation but could add only nine runs before “slashing” SA’s batting line-up into further misery. Farhaan Behardien came in next as the hosts brought up their 50-run stand with three crucial wickets already send back. Partnering Hendricks, taking the safe route looked the only way as the match looked to get more and more out of reach. South Africa reached the 10-over mark on 79/3 Johannesburg witnessing boundaries drying up with every passing over as the hosts needed 124 runs in 60 balls. With the match seeping away, South Africa, with wickets in hand for the final overs, saw Hendricks and Behardien finally taking on the Indian bowlers. After getting settled in quickly, both were seen wielding their woodwork as they hit four boundaries against Pandya and Chahal in eight balls. Hendricks brought up his maiden T20I fifty in the 13th over, which was a cue that the time for knick and run was over as South Africa needed 92 off 42 balls. However, Bumrah and Chahal’s dot balls had managed to keep the pressure on the duo could add just 17 runs in the next two over before Behardien’s desperate attempt to hit a maximum aw him giving his catch to Pandey at long-on. However, it didn’t matter to Hendricks who went about with his brutal stokeplaying and took Bumrah to two boundaries in the very next over, reducing the game to 65 runs in the last four overs. South Africa needed a couple of big overs to get in the game and when Klaasen hit Pandya for a boundary and a six in the next overs, things looked upwards for the hosts. But, as things have been for SA this series, they floundered just when they were looking a threat. Hendricks, Klassen, Morris, and Paterson were all dismissed in the next over, writing off all hopes at an instance taking the outcome beyond any doubt. South Africa eventually ended their innings at 176/9, losing the game by 28 runs.